The chemicals, collectively known as reactive nitrogen oxides, are produced by soil bacteria that feed on naturally occurring ammonium—as well as nitrogen fertilizers from industrial and agricultural sources that enter soil from the atmosphere. "This study has profound implications for future air quality," said Jonathan Raff, associate professor in the School of Public and Environmental Affairs at IU Bloomington. "Human activities, such as fire suppression, fertilizer use and climate change, are causing forest populations to shift from stands of trees whose soils do not emit these gases to those that do. "Reactive nitrogen oxide gases from fossil fuel burning have been well curbed over the past several decades due to effective policy," he added. "However, our study shows that, as forests change, we can expect higher background levels of nitrogen oxides, which could make it more difficult for some regions to achieve the National Ambient Air Quality Standards for nitrogen oxides and ozone." Raff's laboratory is one of the few university-based facilities in the country able to accurately measure reactive nitrogen oxides emitted from soil. The gases include nitric oxide, nitrogen dioxide and nitrous acid. "In forests, these gases are really under the radar, partly because they're so difficult to detect," said Ryan Mushinski, a postdoctoral researcher at IU who led the study. "A lot of people also simply don't think about soil as a significant producer of harmful air chemicals." Although it's known that certain types of ammonia-oxidizing bacteria can emit reactive nitrogen from soil, researchers at IU discovered that trees can be divided into two groups: those that enhance nitrogen oxide-releasing bacteria activity, and those that don't. 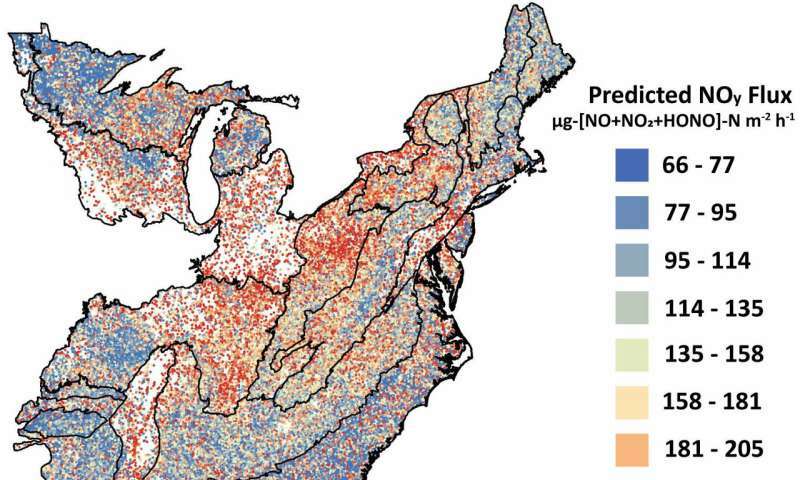 The study, which is the first to identify forested regions in the U.S. that emit reactive nitrogen oxides based upon soil types, was facilitated by a review of soil data from 78,000 forest plots across country from the USDA Forest Service Forest Inventory and Analysis Program. The analysis was made possible in part due to work led by Richard Phillips, an associate professor in the IU Bloomington College of Arts and Sciences' Department of Biology, who is a co-author on the study. Phillips has pioneered research that connects specific tree species with specific soil types based upon their underground fungal networks. "It's difficult because people really like trees such as maples and poplars," he said. "But without greater awareness or policy changes, we're not going to see a reduction in the harmful gases they encourage." This work relates to Prepared for Environmental Change, the second of Indiana University's Grand Challenges initiatives, which brings together a broad, bipartisan coalition of government, business, nonprofit and community leaders to help Indiana better prepare for the challenges that environmental change brings to the state's economy, health and livelihood.